Yesterday my mother and I visited the Barnes Foundation, a wonderful museum outside of Philadelphia. Unlike a traditional museum, this house-school-museum was curated by Dr. Barnes, its founder and remains in its original design according to the rules set forth by him in his will and through his Foundation. In addition, rather than artwork being organized by time period, style or artist, each wall of the museum is organized according to Dr. Barnes' own interpretations. Some walls have a particular color that runs throughout each work, some walls position works to show how artists were inspired by others and sometimes there is furniture, candlesticks or sculptures by the wall that serve Dr. Barnes' vision. I remember two Renoir paintings of fairly large women, each with a fairly large chair perched underneath them. Alongside the paintings are pieces of ironwork that Dr. Barnes collected and placed on the walls, adorning the paintings, with their shapes often mirroring shapes in the paintings. One of the most poignant parts of the experience was learning about how different artists like Cezanne and Renoir influenced each other by looking at paintings right next to each other. In fact, the docent who guided us through the house explained the importance of these relationships and how common they were among artists, even over the course of decades. In fact, the collection at the museum is so rich that we could look at a painting from the 18th century and see how it influenced an artist from the 19th century. As a former art student, I remember studying different painters and analyzing their techniques and styles. I remember seeing what my peers were doing and being influenced and inspired them, even at a young age. In fact, art as we know it would not exist if artists had not shared their work, critiqued and talked about each others' work or picked up techniques they admired. I'm sure some of you have at some point read about or imagined those dark cafés thick with smoke with artists and poets sitting around drinking absynthe, smoking cigarettes and reading poetry or critiquing art. These kinds of communities are glorified in the history books as labs of innovation and a vital part of our cultural heritage. As a teacher, I find that I practice the same kinds of sharing, reflection and inspiring dialogue with my peers, though my art is not painting, but teaching. Some of the conversations I've been reading recently point to the fact that many schools, districts and educational leaders look at teaching as a scientific algorithm; something that can be pared down to scientific data-based methods. So, I wondered, is teaching an Art or a Science? I decided to poll my colleagues. However, I was curious to see what people would choose when faced with only an 'either/or' situation. 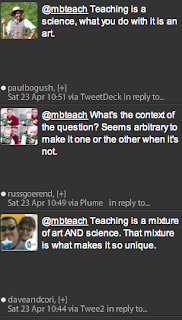 If you go to the poll page, you will see that most people believe that teaching is truly a mixture of both, but still, when faced with a decision, most people (a large majority) chose the 'art' option. As for the argument about art being both a Science and an Art, I would agree. However, I would also argue that a big part of art includes science. A good artist knows the chemical composition of his or her materials. Certain paints contain cadmium, certain chemicals have certain effects on the texture of paints, still others can turn a paint into a glaze. Master artists understand colors and use them purposefully to create an emotion, an experience or an impression. In that way, Art is a Science, but we still consider it Art. In the same way, a good teacher knows the composition of his or her curriculum and his or her students. Master teachers understand their students and the curriculum and know how to create learning experiences for his or her students. 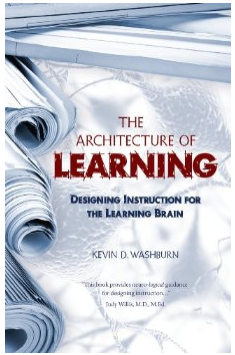 This requires a scientific understanding of how the brain learns and how to engage students, but it takes an artist to create a powerful, deep learning experience. I am so excited to announce the second annual edcamp Philly! It is a day full of learning and making connections with teachers just like you! The day is completely unstructured until that morning, when the schedule of sessions is built by the attendees themselves. Sessions can range from discussions about assessment to sharing of Web 2.0 tools to interactive sessions. There is a lot of social networking and use of technology, but it is NOT a technology conference. Next to someone with an iPad you will also see someone taking notes on a legal pad. However, if you are looking to open up your classroom to more technology this is the place to go. The best part of edcamp? The Rule of Two Feet. If you walk into a session and it's not what you expected or you are not impressed, you can simply choose a different session. What's more, you can take tips, tricks and ideas back to your classroom on Monday and the whole day is FREE!